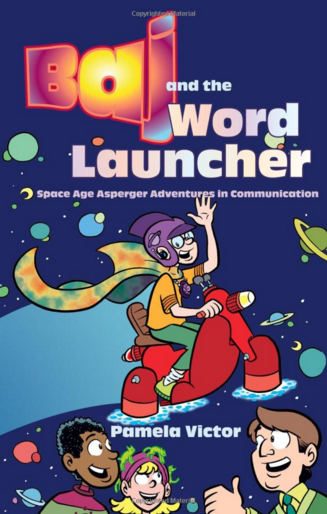 ​uses sci-fi to teach social and communication skills. Baj lives in the future on a planet called Aular and in many ways is like any other kid, but he has trouble reading body language, making eye contact, and taking turns in conversation. ​When Baj is given a special present—a magical communication kit—he begins to understand the complex rules of the social world. An invisible Calming Cape comforts his body, making it easier to keep his cool in difficult situations; a Word Launcher helps him decide the best words for the moment; and Listening Aids help him focus on the important words when people talk. But will Baj ever be able to do all these things without the help of his enchanted gadgets? To find out, join Baj on his flying bicycle as he embarks upon space age adventures in communication! "I think this book would be a useful addition to the library of any secondary school with youngsters with Asperger's Syndrome or higher level ASD." "Baj has real family adventures, confrontations, successes and failures , and the book is positive and full of humour. It could be read by children from 7 upwards and could also be used with older pupils who have special needs." "This is an interesting combination of fiction and therapy... The device of using a science fiction story, which removes the action just that bit from the 'earthling', is a good one, and children should respond very well to it. The style is slightly unusual in that it is aimed very specifically at children with AS. Feelings are discussed freely - necessary given the themes of the book." "For those people working with children who have control and communication problems, this book is a must. It is not too young or easy for 10 or 11 year olds to appreciate but also not too old for younger children. It is well written with places where you can stop and discuss the book together. A wonderful read for parents or workers to read together with a child or a small group."